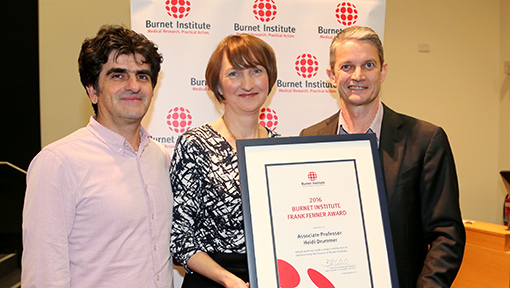 The Deputy Head of Burnet Institute’s Centre for Biomedical Research, Associate Professor Heidi Drummer has been recognised with the Institute’s prestigious Frank Fenner Award for her landmark research into hepatitis C.
Associate Professor Drummer’s laboratory conducts studies into hepatitis C virus (HCV) with a special focus on the development of a vaccine. To date, no vaccine exists for HCV, which is estimated to chronically infect three percent of the world’s population, causing 350 million deaths each year. Delivering the 2016 Frank Fenner Lecture, Associate Professor Drummer said a vaccine is desperately needed to work in concert with new direct acting antiviral drugs to achieve HCV elimination. Burnet Director and CEO Professor Brendan Crabb AC said Associate Professor Drummer’s outstanding research has brought that vaccine closer to reality. “Through the creative brilliance of Heidi and her team and collaborators … we are going to see one day the elimination of hepatitis C as a public health problem, and hopefully one day its eradication,” Professor Crabb said. Associate Professor Drummer said she was honoured to receive the Frank Fenner Award and paid special tribute to her dedicated laboratory staff and collaborators. “I would like to extend my sincere thanks to all the donors who have supported our work, the funding agencies and the fantastic team that I’ve been able to work with over the years,” Associate Professor Drummer said.